Venice is a city nestled in an old world charm with rippling canals and sun dappled piazzas, not to forget the awe inspiring historical marvels standing proud and tall all across the city. An ideal escape from quotidian life, a visit to Venice will transports you to the glorious yesteryears of Venetian past. 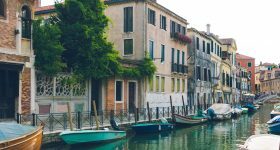 With stunning works of art echoing all across the city, lacey bridges and quaint alleyways, Venice is sure to leave you love sick if you intend to go solo. If you're going with your partner, you're in for a real treat because Venice is touted to be one of the world's romantic cities and we, completely agree. 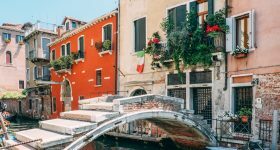 This all inclusive Venice Guide will tell you you’d like to know before booking your ticket to this postcard perfect city ! While planning your trip to Venice, you ought to keep 3 things in mind - the Weather, Festivals and Acqua Alta (high water tide). In a nutshell, the best months to visit Venice - April, May, June, September, and October. Note, they also happen to be the busiest and most expensive months to be here. April marks the beginning of spring in Venice with highs of 16°C and lows of a comfortable 12°C. While the breezy, balmy days are great to cruise the gondola and walk around the city, it also happens to be packed with tourists ergo leading to a hike in prices and long long queues outside attractions. May Day ( May 1st) is a holiday and around this time, the hordes double, so if you’re looking for a quiet getaway, Venice during then these months should not be your first choice. Also, finding economical accomodation during this period can be quite a challenge. If you’re here around May & June, pack your swimsuit, as it is ideal to soak up the sunshine by the beach and take part in watersports. 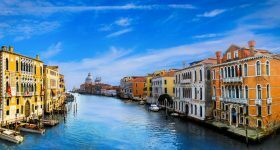 Every odd year, Venice hosts the Art Biennale , which runs from early June to November and during this period the city is bustling with exclusive parties, luxury yachts and wild parties. Though July is the hottest month in Venice, it is also marks the peak of tourist season. July and August can get pretty humid considering the proximity to sea, and during these months you are likely to find a surprising number of kids around as the summer holidays for European countries are during this period. Lido beach is sure to be packed with sun baskers and chances of getting a room in the seaside resorts here and practically zilch. During these months of stifling heat, the canals tend to ripe in odour and the mosquitoes are out full force during the summer months, so do take precautions against these bites and the sun. Festa del Redentore, a festival that combines religion with entertainment takes place in the 3rd week of July and is a popular spectacle amongst the tourists. September and October marks fall with highs of 24 degrees Celsius and lows of 17 degrees Celsius, making it a great time to visit Venice. The city is sparsely populated with tourists, accommodation is easier to get and weather is great! However, the downside of this period is the acqua alta ( "high water") which is likely to flood the streets more frequently during these months. However, acqua alta is a Venetian way of life and thought it can hamper a few of your plans, it is a unique experience and a risk worth taking. From the beginning of September for a week and a half, The Venice Film Festival takes place on the Lido and though this won’t make much of a difference for those staying in Venice, Lido is out of bounds during this period and most 5 star hotels tend to be booked out by film stars throughout the city. Sudden rain storms are a feature of fall in Venice and these can be devastatingly heavy, so don’t forget to lug on your umbrella, gumboots and windcheaters. These 5 months constitute the winters in Venice and is considered the off season. Fewer crowds, huge drop in prices for accomodation, food, tickets, etc and bone-chilling weather with lows of 4 degrees celsius and highs of 12 degrees celsius. In November, Venice starts feeling like a local town as opposed to the tourist infested city and is a great time to sip the famous Venetian hot chocolate and enjoy the crisp air. Winters here are accompanied by rains, especially in December and January and the acqua alta is at an uncomfortable force during these months. So, keep your gumboots dear and close every time you step out. In December, a heavy fog settles in on the city creating a haunting cityscape with misty temperatures. Gloomy winter ends on a colourful note with the Carnevale , a visual delight with masked and costumed figures crowding the city, processions bedecking the illuminated squares, candle lit parade of boats, street performances and opulent masquerade balls. St. Mark’s Square is the focal point of all the celebration where you’ll witness the most elaborate costumes and masks. The Carnevale celebrations lasts for about 2 weeks before the actual Carnevale Day and though this period is unfortunately accompanies by sky high hotel prices, it is a brilliant glimpse into the culture facet of Venice and a once in a life- time experience ! The trick is to think like a local, feel like a local and live like a local. The first and foremost tip to save money in Venice is choosing the right time for your visit. During peak season ( May - August), the prices are sky high for almost everything. From accommodation to flight tickets to price of gondola rides, food and more. If you skip visiting Venice during this period, you won’t just save money, but also time. Due to the countless scores of tourists, the queues take upto 45 minutes to 1 hour and can be quite a buzzkill for travelers who are looking to truly enjoy the beauty of the city. Fall and Winter months are great to visit because the hotels are not likely to be crowded, lesser people hence lower prices too. Backpacking in Venice with hopes of finding a hotel to stay in as and when you land there might not be such a good idea , especially during peak season , simply because most budget hotels tend to be booked out and you’ll have to pay an exorbitant amount to get decent accomodation. Online bookings actually help you save a few euros, so it is highly recommended to have your accommodation sorted pre hand. Accomodation in Venice is quite expensive, especially if you decide to stay near St. Mark’s Square and its whereabouts. Instead, you can save quite an amount by standing on Lido, Mestre and other nearby islands and commute to the city centre using the well- connected waterways. Though Venice is one of the most pedestrian friendly cities on earth, you are bound to get tired and will need a boat to swoosh you to your next destination. For the same, the vaporetto or water bus happens to be the cheapest mode of transport. Buying a pass for the number of days you are around gives you unlimited access through all the Vaporetto lines which pretty much covers all of Venice. You can read more about Vaporettos rides and other forms of transportation in Venice here. Gondola rides are the most quintessential Venetian affair and one should not deprive themselves of this experience because of the exorbitant prices quoted by the gondoliers. The Venetian government has established a standard rate of €80 for a 40 minute ride on gondola of 6. The evening rates can be higher and with a serenade tour, the prices are likely to get steeper. Bargaining with gondoliers can be a lost cause, hence we would recommend purchasing Gondola tickets online for a cheaper rate in order to have a haggle and hassle free experience. Venice is infamous for its overpriced mediocre food with quantity that can barely satisfy half a stomach. To avoid this trap, skip cafes in the city centre and walk into secluded alleys and seat yourself in quaint cafes and restaurants far far away from the touristy parts of the city. 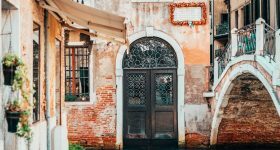 In the neighbourhoods of Dorsoduro, near the Accademia, in the islands of Murano, Burano and Torcello, you are likely to find pocket friendly bites close to authentic Venetian cuisine. Find out the closest bàcari, and head here for tapas-styled cicchetti, small plates of food that start at the appetising price of €1. Try out these places for a great meal - Pizzeria ae Oche , Pizza al volo, Vecia Gina in Sant' Elena, Trattoria Alla Madonna and Brek. If you’re in Venice for a long period of time, you can consider buying groceries and cooking your own meal as the supermarkets and street markets have everything you could possibly need. Make a trip to Rialto Market and the fresh local produce will compel you to eat home cooked food for a few days at least! Restaurants and cafes in Venice have cheaper lunch menus, care off care of the locals working around the city. Lunch timings are between 12 noon to 2 PM in most places and we’d suggest you splurge on a good lunch than on an extravagant dinner as the prices tend to be higher after sun set. Venice is best explored on foot , coupled with a few boat tours to rest your legs. There are many many churches and museums that demand to be explored and if you’re on a time constraint, you should consider buying the various passes the city offers in order to skip the lines and gain priority access. Else, majority of your time will be spent in standing in queues outside each attraction. Some of the passes you can consider buying are the Venice Museum Pass, Chorus Circuit Pass and St. Mark’s City Pass. Booking tickets for guided tours of the Doge’s Palace and St. Mark’s Basilica are a good idea to skip the line and get an exclusive guided tour of the famed structures. Venice also has many walking tours like the Rialto Market Tour, Venice Craftsmenship Tour , Venice Walking Tour etc. Booking them on HeadOut will help you save a few bucks and earn cashback as well! 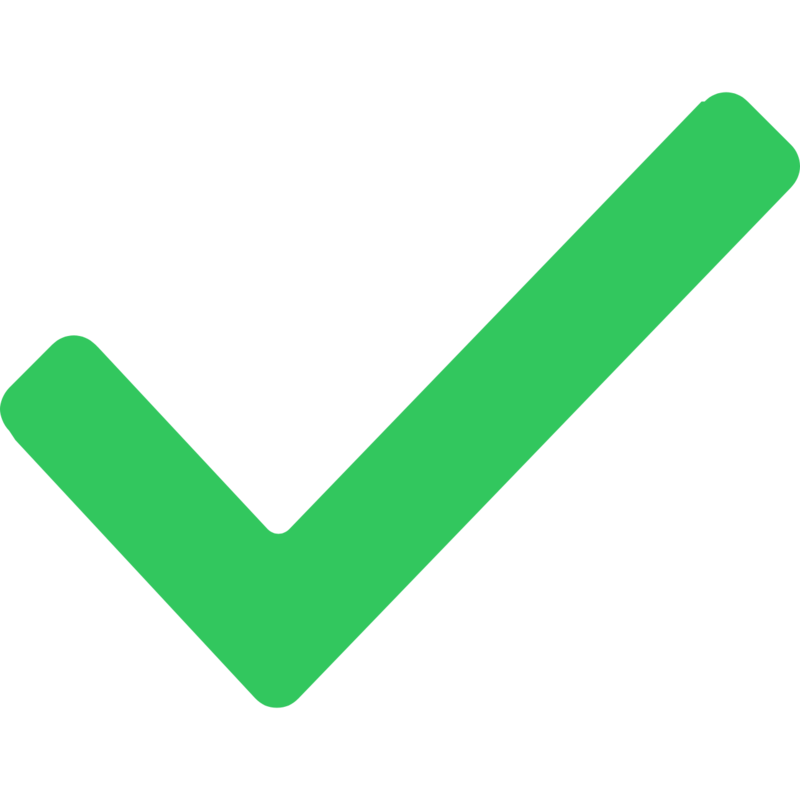 Albania, Andorra, Antigua and Bermuda, Argentina, Australia, Bahamas, Barbados, Bosnia and Herzegovina, Brazil, Brunei, Canada, Chile, Colombia, Costa Rica, Dominica, East Timor, Grenada, Guatemala, Honduras, Israel, Japan, Macedonia, Malaysia, Mauritius, Mexico, Moldava, Monaco, Montenegro, Nauru, New Zealand, Nicaragua, Panama, Paraguay, Peru, Saint Kitts and Nevis, Salvador, Samoa, Saint Lucia, Saint Vincent and the Grenadines, San Marino, Serbia, Seychelles, Singapore, South Korea, Taiwan, Tonga, Trinidad and Tobago, United Arab Emirates, United States of America, Uruguay, Vanuatu, Vatican and Venezuela. Citizens of countries not previously mentioned need to get a Schengen Visa to enter Venice. Some of these countries include - India, Armenia,Bhutan, Combodia,China, Nepal, Turkey, Russia, South Africa and many more than you can check here. In Venice, the ATMs are called ‘Bancomats’ and you will find them outside walls of banks all over the city. They have multilingual screen and are very user friendly. Most establishments (hotel, shops and restaurants) accept credit cards too. 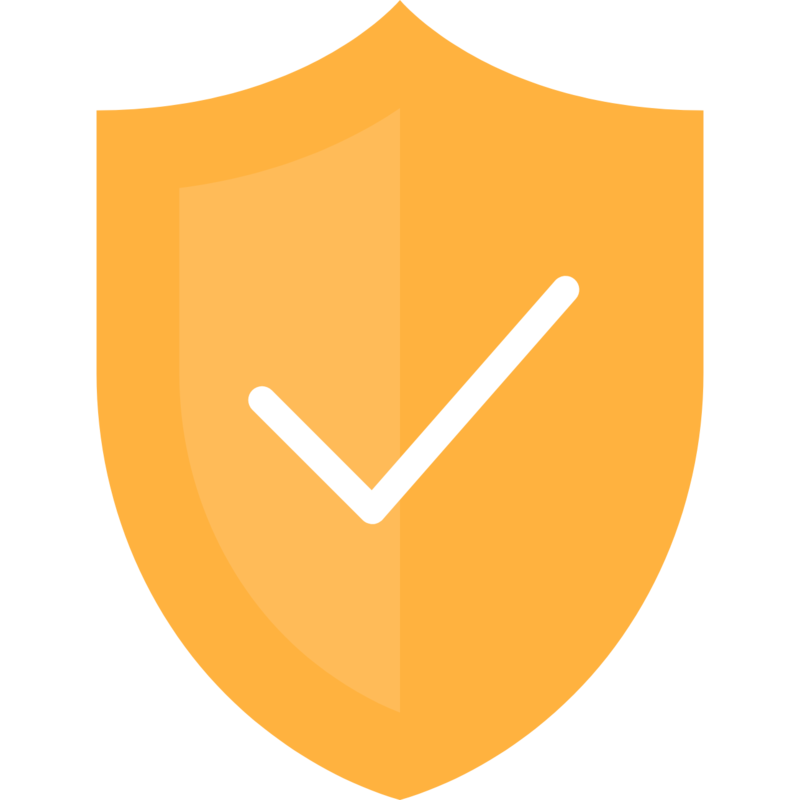 Make sure to authorize foreign ATM transactions with your bank before you leave your home country. Locals banks tend to have lower withdrawal limits so if you are denied a transaction, dial in a smaller denomination. Bancomats of Banco San Marco almost always dispenses a combination of €50, €20, and €10 banknotes. So if you find any of these bancomats hop in and dispense cash as you’d rather carry smaller denominations than the standard 50-euro and higher denominations notes that most bancomats dispense. This tool will further help you budget your Venice trip. In Venice, tipping is not expected in hotels, restaurants, bars, taxis, or for any other service. However, a tip is not considered offensive, hence a tip from the heart is considered a gesture of appreciation. Tipping around 5-10% of the bill is the norm here, so you can follow the same for most purposes, except hairdressers who are given a slightly higher tip of 10-15% of the bill. Festivals are an integral part of Venetian Culture and they have elaborate festivals throughout the year, each bigger and better than the other. See which festival you can catch depending on your month of visit. March - Festa della Donna (Women's Day) and Saint Joseph's Day, also celebrated as Father's Day in Venice. June - Biennale Art Expo ( every odd numbered year) , Art Night Venezia. Venice's population in 2018 is estimated at 633,000 and a majority of them are local Venetians followed by Europeans who have migrated to the city. Most of the citizens are Roman Catholics but there are many from other sects of Christianity and a generous number of Jews who reside in the Venetian Ghetto area. The Venetian way of life is unique and charming in its own way. Enveloped in a laid back atmosphere, the locals here love their afternoon siesta and hence you will find most shops and stores shut for a few hours in the afternoon. The Venetian cuisine is considered balanced and ideal with generous portions of lean proteins (lots and lots of fish) good fats and fresh produce abundant in minerals, vitamins and antioxidants. Obesity is a rarity here and that has a lot to do with their eating habits and the fact that most of Venice is vehicular free hence leaving no choice but to walk, rain or shine. The culture of this city is an riveting and vibrant as its lifestyle. Eminent playwrights and authors like Shakespeare, Anne Rice and many more have often mentioned the alluring Venice in their works. The culture hub of Italy, this city has had a distinctive and thriving artistic environment. It was called the Republic of Music for its contribution towards Italian Opera and is the founding city of the game changing form of art called the Venetian School. Not to forget the birth of Venetian- Gothic architecture that mushroomed in the 14th century and is not seen all across the city. Venetians are big on cultural festivals, one grander than the other and the grandest of them all being the Carnevale of Venice. Venice is known for its scrumptious platter of sweets and wine found nowhere else but within the premises of this floating city. When you think Italian food, Pizza and Pasta are the staples that prop into your mind. Most people who come to Venice flock in to touristy eateries serving pizza and pasta in the hope for authentic venetian food. You’ll be surprised to know that Venetian Cuisine is not remotely close to pizzas and pastas. Due to its close proximity to the sea, venetians indulge in a lot of seafood and local produce like asparagus and artichokes. Though the list below barely scratches the surface of the umpteen dishes this city has to offer, they are the absolute must trys one cannot afford to miss. Do try the Fegato alla veneziana, moleche crabs and fritole ( only during Carnevale) after you’re done trying the below. Rice is a staple in the Venetian meal, hence risottos are routine on all menus. However, risotto al nero di seppia is a stunner because of its black colour attributing to squid ink and an exception taste like no other risotto. This risotto is cooked with pieces of squid or cuttlefish and lots if wine. Though it may turn your teeth purple, a bite of this tastes like sea say the locals. Made with long thick whole wheat pasta and salt cured fish ( either sardines or anchovies), this dish is one of the famous Venetian pasta preparations that all pasta lovers are bound to fall head over heels in love with. It is traditionally served as a starter on days such as Good Friday and Christmas Eve, but you will find it all around Venice , especially in Cicchetti bars. A typical Venetian snack of two triangular pieces of white bread with all kinds of inventive fillings inside messily spilling out. From tomatoes to mozzarella, to prosciutto cotto to shredded radicchio with olives and artichokes you will find all sorts of filling inside the Tramezzino and is the perfect food to grab on the go and munch on while walking the length and breadth of the city. This is the classic Venetian aperitif, a mix of white wine, Aperol (sweeter) or Bitter Campari and Select (bitterer) and a splash of seltz or Sparkling mineral water or Soda. Getting around Venice can be quite tricky , but once you get a hang of the waterways and the different modes of transport that exist in this city, you are good to go. 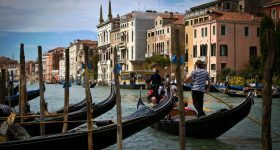 Check this detailed blog post on the different modes of transport available in Venice , the routes, lines , fares and tickets. - Piazzale Roma - This is where people arrive by public bus, airport bus, taxi, or car. - Marittima Cruise Terminal - This is where people on cruises and ships arrive and depart. - Tronchetto Parking Island - This parking island has indoor and outdoor parking for 1000s of cars and is also the arrival point for most tour buses. If you intend to take the People Mover, you can check out its schedule here. The 4th busiest airport in Italy, Venice Marco Polo Airport (VCE) is the international airport of Venice and is located on the mainland 13 kilometres from Venice. With separate departure gates for Schengen and non-Schengen flights, this airport hosts flights to many European countries and a few partly long-haul routes to the United States, Canada and Middle East. It features an impressive set of shops and cafes, and various VIP lounges and other luxurious facilities. The Marco Polo airport is also very well connected to the city centre of Venice via sea. Another airport located in the Venice is the, Treviso Airport situated around 31kms away from Venice also known as Venice - Treviso. It usually hosts low-cost airlines , mainly Ryanair and Wizz Air. Serviced by both full-service and budget airlines, you can find great deals on flights to Venice via sites like SkyScanner and Expedia. 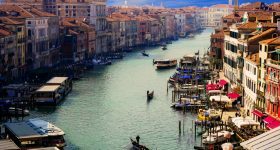 With great international connections, it’s also a convenient to plan a layover visit to Venice while you’re traveling elsewhere in Italy. Thank you Lakshmi for your itinerary I’ve been planning this trip for years and I used this article as a foundation for my own. Glad you found the information useful. Have a great time in Venice!